It is a cold reality that aquariums (particularly marine aquariums) can't operate without electricity. The items used to keep your tank critters happy and healthy include electrically-powered air pumps, powerheads, protein skimmers, automatic feeders, and lights. For the most part, aquarium equipment runs on alternating current (AC) electricity, the same as almost all of the lights and appliances in your home do. In a power outage, your aquarium stops functioning. 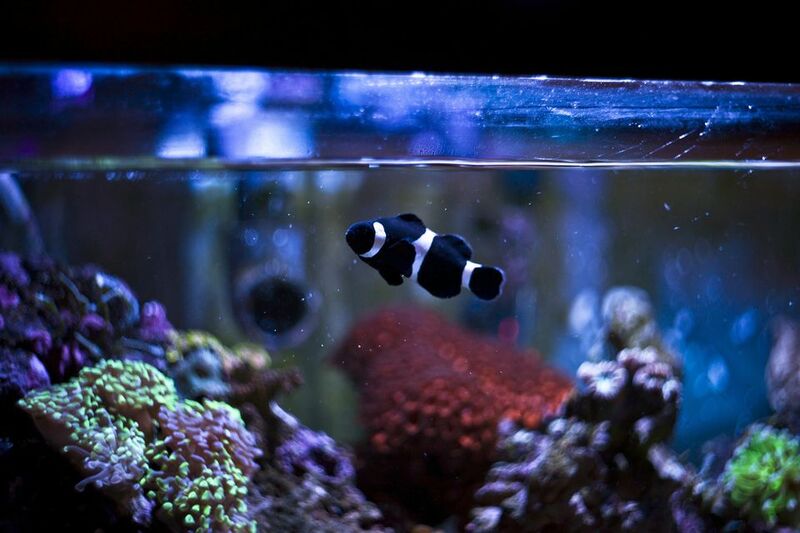 There are certain functions in a saltwater aquarium which are essential for its survival: gas exchange and water movement. Even the most sensitive corals in a reef tank can survive for days without intense light, but the viability of fish, invertebrates, corals and beneficial bacteria deteriorates rapidly without a reasonable supply of oxygen. This being the case, in the event of a power failure, the primary objective (both short and long-term) for the aquarist is to supply oxygen to the tank and move water (even periodically) about in the tank. This is bare bones survival and some of your tank's filtration systems (wet/dry trickle, canister filter) will not be functioning. The nitrifying bacteria which resides in the tank (on the live rock, tanks walls, etc.) will live and continue to process ammonia, nitrites, and nitrates if oxygen is supplied at least periodically. For most tanks, when operating properly, a vast majority of gas exchange (carbon dioxide out and oxygen in) takes place at the water surface of the tank. Protein skimmers and wet/dry trickle filters also contribute to gas exchange during normal operation, but will not be functioning during a power loss. Take any type of clean container and use it to scoop up some aquarium water. Hold the filled container some distance above the aquarium, and pour the water back into the tank. Repeat this process numerous times. You provide more oxygen by pouring the water from higher above the tank, the higher the better. You also provide more oxygen the more times you repeat the pouring. You will know you need to provide more oxygen by manual aeration if the fish are coming to the surface gasping for oxygen. To avoid messing up the substrate, place a small plate or bowl in the tank and pour the water onto this area. Adam Goldstein tells how his aquariums have survived multiple power outages, some for up to three days. Normal automotive batteries should not be used indoors, as they emit sulfuric acid fumes (bad stuff), but Odyssey batteries are sealed (don't emit fumes) and are therefore safe to use indoors. Adam utilized two Odyssey automotive batteries with a 925 cold cranking amps rating and a 400-watt DC-to-AC power inverter. With this setup, Adam could run his normal AC pumps and filters but he did not turn on his tank lights (they used too much electricity). While he recharged the batteries in his car, the batteries could be recharged using a solar panel. While not a viable option for many people, having a gasoline-powered generator on hand may be the best long-term solution for dealing with a power outage. To be sure, they are not inexpensive, but for $400 to $500, you can purchase a 5,000-watt generator which will not only keep your aquarium(s) running normally, but also power a majority of the electrical appliances in your home. When you consider how much money you have invested in the critters in your marine aquarium, it's not a stretch to realize that a $500 investment in a generator is really cheap insurance. Plan for the worst and hope for the best. If you do purchase a generator, you might want to seriously consider having an external 220-volt receptacle hard-wired into your house electric panel. This way, you won't have to leave a window open for all of the extension cords to run through. You will be able to run a lot of your electric devices with your normal outlets. When the power goes out, all you have to do is roll your generator out of storage, plug it into the receptacle and fire it up. Make sure that you trip your main circuit breaker, though. Otherwise, you will be supplying power to a lot of other people through the power lines. If you are not extremely comfortable with electric wiring, hire a licensed electrician to make your wiring modifications. If you don't want to make the investment on the off chance that you will be hit with a long-term (more than a few hours) power outage, there are many retail outlets (Walmart is only one) that offer to refund your purchase of a generator if you return it in an unopened box. No matter what your solution is to deal with a power outage, whether it is caused by a blizzard, hurricane or total power grid failure, the key to survival is to plan ahead.